“Objective Signs of Life” is the theme for August 2017, according to the Blue World Economic Index® as we moved a full .05 from -.09 to -.04! After a rather slow start to the month things really started to heat up fast. Inflation and Real Estate were the only real drags on the index for August, especially Housing Starts and Permits, which suffered an oversized and uncomfortable swing from 1 to -.5 on the 16th. That kind of move is rare. Industrial Production ended a streak of positive hard data in Manufacturing, but at least it was the exception not the rule and maybe a blip, as the Philly Fed report is still in high orbit. That brings us the Chicago Fed National Activity Index, which took an unexpected drop considering the strength of every other regional Fed report in the month. Ultimately, four out of six hard data reports in Manufacturing were positive for August so the unbridled optimism of the last nine months may finally be translating to objective improvement. We’ll have to see if it holds. Five out of the Eight Major Categories remained flat or gained ground including Consumer, Employment, General Measures, Manufacturing and Retail. Employment was the big winner in this group gaining an eye-popping .31. The Retail bump (.29) has to be viewed with some caution as conflicting reports are pulled up by reports that are often contrarian and/or volatile. Inflation and Services lost fractionally, and Real Estate led the decliners by losing a full .2. Tomorrow is jobs report Friday, and our report is expected out before Noon Eastern. We’ll see you back here at the close of September and hope to report another move to the North. Have a safe and wonderful Labor Day! GREAT…if it holds…but some WONDERFUL news was hiding in the weeds! Today’s release provides plenty of reason for OPTIMISM. Are you paying attention, Fed? That is the only downside we can see to this report, the potential overzealousness of the Fed in pursuing another rate hike. Yes, this is a fine report, but it is still in the overwhelming minority of hard data reports hinting at any strength or momentum. Additionally, one report does not a movement make. We need to see this kind of strength sustained and built upon before declaring “improvement.” We can’t just keep sprinkling a good report in here and there with other mediocre to poor reports and be gung ho about raising rates. So, that’s our cautionary note. Now, let’s go enjoy the numbers! The headline is net 209k, and of those 205k are Private Sector gains. That’s the first time since February that the private sector topped 200k. The Labor Force, Total Employed, and Participation rate were all up. Please continue to be mindful, however, that participation is still below 63%, but let’s not let that be rain on today’s parade. Up is up. 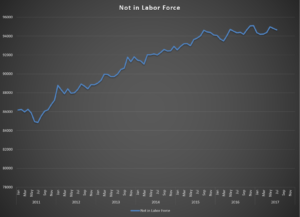 The Not in Labor Force tally is down two months in a row and tantalizing us with a suggestion of flattening. That’s the graph this month. Total Unemployed is essentially flat to June. Wages were good for the month, still rather muted for the year, and the work week stayed level. Revisions essentially netted out, but the big news deeper in hiding was that we just saw our first reliable hint that reality is catching up to sentiment in Manufacturing as we’ve had two big months of gains in a row to coincide with and validate the anecdotal Regional Fed reports in the Blue World Economic Index®. Services were also squarely in the win column for July. All in all, two decent months in a row where July is a little better than June and this will provide a much needed lift to the Employment category of the Blue World Economic Index® for August, which will post at the end of the month. See you then! 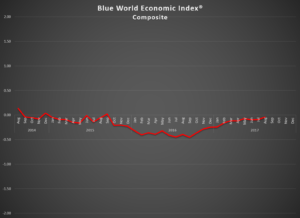 The Blue World Economic Index® for July 2017 was essentially flat for the month showing just a .01 improvement to -.09 from a -.10 in June. Our read is that the economy wants to let loose, but the continued and mounting uncertainty over everything from policy to Putin is just too big an anchor to allow for take off. We were, frankly, surprised that consumer and business optimism continue to hold up so well in the absence of any hard data to support the anecdotal measures, but the momentum slip is palpable. If something tangible doesn’t happen soon, those numbers simply won’t hold. The Fed would do well to react to actual economic data as opposed to anecdotal survey measures and the stock market in considering further rate moves. Of the eight Major Categories Consumer Measures, Inflation, and Retail pulled back fractionally while Employment, General Measures, Real Estate, and Services made small moves to the North, where General Measures was the only double-digit gainer at .14. Overall Manufacturing was unchanged as the Fed subgroup resumed its climb by .12 to .53 and the Non-fed subgroup lost .03. The BLS jobs numbers will be out this Friday the 4th and we will be here in our assigned seats to read, analyze, and report. See you then.